This sweet red wine from the South of France "Emperor Charlemagne founded in 785 a Priory to honour de Virgin Mary. This Château, a historic monument since 1826, in the heart of Catalan country, is situated on wonderful Passa land, near the VDN capital of Thuir. 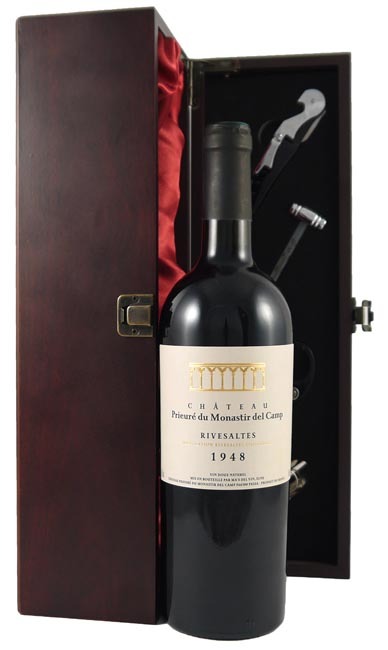 Today it represents a unique and historic collection of marvelous wines, whose aromatic range evokes the heady days of Rivesaltes AOC of the mid 20th Century. The recovered vintage years from an exceptional vertical tasting from 1945 to 1968. Can match perfectly from aperitif to digestif, wonderful with cheese, chinese food and Italian desserts." Robert Parker: Drink now - 2030. An amazing gift.